Mac Campbell with a typical mixed bag from the Peninsula. WITH so many commercial fisheries seemingly run as purely money making ventures, with branded sponsorship from large tackle manufactures and as many as five opens on one water per week, it is a delight to find a complex which places fish welfare as their top priority. 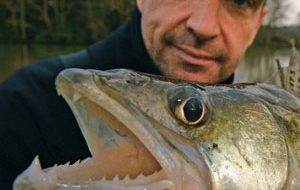 The policy of John Heath of Blake Hall Fisheries is that if you look after the fish, then the fish will look after the business. He places the condition and welfare of the carp, bream, chub, roach and perch as his number one priority, closely followed by the comfort, access, creation of a friendly atmosphere and enjoyment of every angler. It looks like John Heath is onto a winning formula. We were amazed to find that this four-lake, spring-fed complex is only four years old. A fifth lake called Capricious is due to open in May 2006, stocked with small fish up to 1lb. Situated part way up the side of a valley on the outskirts of the Staffordshire Moorlands, the wind does tend to whistle round your ears and the venue is affectionately referred to as ‘Bleak Hall’ by its regulars. Yet there is a remarkable amount of bank side vegetation and the care taken to ‘mature’ the venue has paid off, as it looks at least twice its age. The Scandinavian log cabin lodge is welcoming to anglers and walkers alike. Spacious enough to seat more than 50 anglers, it serves tea, coffee and hot food all day in addition to having a fully licensed bar, toilets and excellent disabled access. You can currently park behind 80% of the lake’s 130 pegs, with plans to create a concrete path by the end of the summer which will create a 100%wheelchair access. Blake Lake holds a big head of chub. traditional bream and feeder venue, so they are creating a 12-acre, 80-peg lake that will be ready to fish in three years. The first lake you come to is called Blake. This rectangular, three-acre, 40-peg venue has four small islands about 20 metres from the bank which anglers can reach from the majority of pegs. It’s a mixed water holding a large head of chub to 2lb, roach to 1lb, plus bream, barbel and carp averaging from 1lb to 3lb. 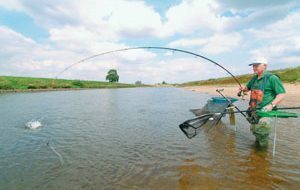 Casting a small 3AAA insert waggler with just one No10 shot down the line whilst feeding caster or maggot little and often over to the island has been the killer method during the winter. Several 40lb plus bags of chub have been taken, with most matches being won with 30lb and every angler being kept busy throughout the full five hours. You can also catch them on the feeder with a long tail of 0.12mm line using a light groundbait in the feeder which clouds as the feeder hits the water. 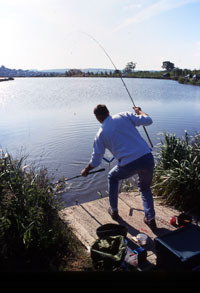 The groundbait should contain four or five casters. The closer to the islands you cast the better but the chub in particular can be lured out into open water. Hot pegs in the cooler months are 31 to 34 and 4 to 11, but when warmer weather is upon us, the spread out and you can win a match off any peg, as long as you get the feeding right! Another warm weather method that works well on this lake is the splasher waggler, with pellet on the hook and feeding half a dozen pellets around it. Fish an 0.13-15mm hooklength with this method as you will hook carp as well as chub. Pellets bought from the fishery can now be used as of 2004 and you can use any type of hook pellet. As with most waters the softer the hook pellet is, the more bites you will get. Corn and meat are also important hook baits. The lake has a good uniform depth of between five and six feet down the track, shallowing up in the margins and over to the island. When you plumb up on the pole line you will find that the near bank slopes away from you for about six metres and after that it’s pretty even. Locals often feed pellet on this six metre line. You can catch on the waggler here with 3lb main line, 0.12mm hook length and a size 18 or 20 hook to the island and have a pole line at 9 -11 metres as well as at six metres. Fish this line with a 4×14 or 4×16 float on 0.12mm rig line matched with a No10 or No12 elastic set at full depth. Also set up a shallower rig in case the fish come off the bottom – for this line feed the larger 6mm pellets on sale three or four at a time and fish a banded 6mm pellet between one and three feet deep. In warmer weather you can catch big carp right in the margins late on in a session and this is your heavy line area where catmeat can work well. 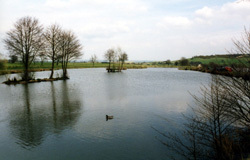 The second lake is Hall, which has 30 pegs and is stocked with mainly roach, skimmers and rudd to 8oz and carp to 1lb. A single, long island is situated at the lodge end of the pool and accessible by about 14 pegs and it has an average depth of six feet. Pellet is the key method here, one the pole. A nice carp comes to the net after being tempted from the margins on Peninsula. Peninsula is a six-acre, 60-peg lake and is the primary match venue. It holds predominantly carp from 1lb up into over double figures, but also contains tench, bream, barbel, rudd and some very big perch. In one match, four stripers were weighed for an impressive 11lb! Here the fish tend to roam around a lot and you might have a burst of four or five fish then a quiet spell, so it pays to keep casting in. The peninsula itself is a hot area especially at the end and down the left side where you have deep water close in and pole is dominant. Here catmeat over pellet can be very successful. It’s also depe at the far end and when the wind has been clowing into the deep water here for a few days some fantastic sport in on the cards. 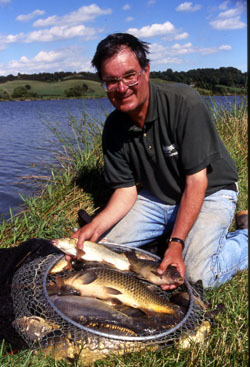 In 2005 Tony plans to drain, restock and turn Peninsula into two lakes with extremely even lake bed contours in order to create the fairest match venue possible. The final pool is called Cabin. Half an acre and 10 pegs in size, it’s stuffed with a huge variety of smaller fish and is ideal to keep younger anglers happy all day with a bite a chuck. We not recommend this venue highly enough. Matches: Matches are held regularly on a Thursday and Sunday through out the year, with a three-hour Wednesday evening open in the summer. Club bookings welcome. There is a 120-peg Super League qualifier on June 19th with a BBQ for competitors after the weigh in. Last summer, both the three and five-hour match records were set with 72lb and 93lb respectively. Restrictions: Fishing 7am to dusk. No boilies, no pellets (under review) or paste. Keepnets can only be used in matches. All nets to be dipped. Maximum hook size is a 10 and it’s barbless only. Groundbait in moderation only. Facilities: Fully licensed bar serving tea, coffee and cold drinks. Food served throughout the day. There are toilets in the cabin, plus you can park behind the majority of pegs. How to get there: Blake Hall Fisheries is situated on the outskirts of Cheadle, Staffordshire. Turn off the A50 at Meir Park, next to the Tesco, go through a village called Blythe Bridge and take the A521 signposted Cheadle. Travel about two miles and turn left at ‘The Huntsman’ pub crossroads. Follow the signs for the fishery and you’ll see it on the left hand side of a large walled house with ornamental lions adorning the gateposts.